The Russian-led ceasefire meant to separate the terrorists from the legitimate armed opposition groups in Syria is now bearing fruit, as some opposition groups are now joining government efforts to topple those foreign mercenaries who have nothing to do with their cause. The Syrian Arab Army and armed rebel groups have repelled a Daesh attack in east Qalamoun, a mountains area to the northeast of Damascus, in what appears to be a first joint campaign involving government-led forces and the opposition as both sides appear to be increasingly willing to work together to defeat terrorists. “Government forces along with opposition groups have managed to disrupt an offensive mounted by [Daesh] in east Qalamoun. Six settlements in this area with a total population of 25,000 have joined the reconciliation process,” Lt. Gen. Sergei Rudskoi, the chief of the Russian General Staff Main Operational Directorate, reported. Political analyst Andrei Manoilo, a member of the Scholarly Council of Russia’s Security Council, told RT that this is a “game-changing” moment since the Syrian Arab Army and armed opposition groups are “increasingly coordinating” their counterterrorism activities against Daesh, al-Nusra Front and other affiliated organizations. In January, a delegation from Damascus and representatives of the armed opposition took part in talks for the first time since a foreign-sponsored coup morphed into a deadly war in 2011. The negotiations held in Kazakhstan were focused on reinforcing the fragile ceasefire which was unveiled by Russian President Vladimir Putin on December 29. The truce deal was part of a package signed by Damascus and several key opposition groups, with Russia, Turkey and Iran serving as mediators. The ceasefire has largely held despite numerous violations which the government and the opposition have blamed on each other. Meanwhile, Russia and Turkey, who serve as guarantors of the ceasefire, have been working on a mechanism to monitor the truce. It is expected to be the main topic on the agenda of a next meeting held in Astana. Syrian President Bashar al-Assad has expressed cautious optimism with regard to the Astana peace process. 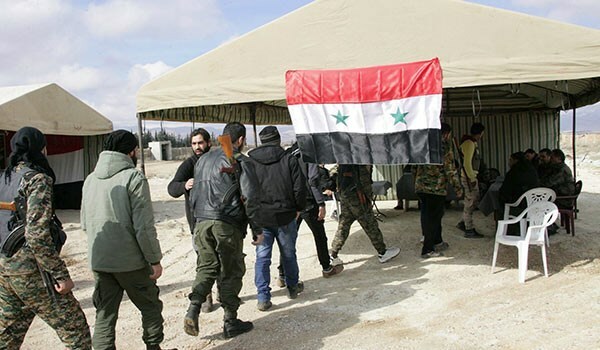 TEHRAN (FNA)- Militants in five more regions in three key provinces laid down arms and joined the nationwide reconciliation agreement with the Syrian government, the Russian Reconciliation Center for Syria announced Wednesday. The Russian Defense Ministry said that negotiations on joining the ceasefire regime continue with various field commanders from the provinces of Homs, Hama, Aleppo and Quneitra. On Monday, Syrian President Bashar Assad extended a decree on amnesty for militants who surrender and hand over their weapons until the end of June. The decree 15/2016 dated July 28, 2016 was extended by President Assad until June 30, 2017, SANA reported. The above-mentioned order was initially issued for the period of three months and on October 27, 2016 was prolonged for the same period. The amnesty also covers kidnappers who agree to release their hostages. Since 2011, Syria has been engaged in war against terrorism, with government forces fighting against numerous militant and terrorist groups, including al-Nusra Front (also known as Fatah al-Sham front) and ISIL. The Greater Israel plan is now heavily compromised, hence the resumption of Israeli bullying against the Palestinians through legitimized land grab. The cabal is losing ground on the world faster than they could blink an eye. This is a going thing. We need to be beaten in order to keep Us honest.